Huygens probe Release - Universe Galaxies And Stars Section. Cassini Preparing for Huygens probe Release. 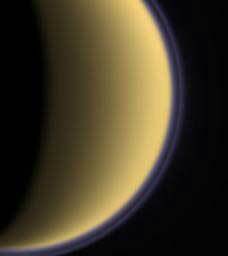 Cassini - Huygens probe sees Saturn's largest moon, Titan. When NASA's Cassini spacecraft took off towards Saturn, it brought along a passenger: the ESA's Huygens probe, which is designed study Saturn's largest moon, Titan. The two spacecraft have been orbiting together for a few months now, but on January 14, 2005, Huygens will make the plunge into Titan's thick methane and hydrocarbon atmosphere. And if it's really lucky, the probe will survive the journey down to the moon's surface, and give scientists a unique opportunity to study an environment that might have been similar to our own Earth's early history. On Jan. 14, 2005, the Huygens probe will plow into the orange atmosphere of Saturn's moon, Titan, becoming the first spacecraft to attempt to land on a Moon in our solar system since the Soviet Union's Luna 24 touched down on Earth's Moon in 1976. Though scientists hope that Huygens will survive the plunge, it will be flying blind through hydrocarbon haze and methane clouds to a surface that could consist of seven-kilometer-high ice mountains and liquid methane seas. That's the picture that emerges from a series of articles - half of them by University of California, Berkeley, researchers - published in the journal Geophysical Research Letters last month and detailing what scientists know to date about the surface, atmosphere and magnetic field of Titan. This view sets the stage for an analysis of new data soon to arrive from the Cassini spacecraft and Huygens probe. "These (journal) papers really give a state-of-the-art picture of Titan, before Cassini goes into orbit around Saturn and the Huygens probe goes into Titan's atmosphere," said Imke de Pater, a professor of astronomy at UC Berkeley who wrote the introductory paper in the series and co-authored four of the nine papers. The papers came out of a meeting De Pater hosted last November at UC Berkeley to discuss what has been gleaned to date about the Moon from optical, Infrared and radar telescopes, including the Hubble Space Telescope and the twin Keck Telescopes in Hawaii. Scientists expect the current sketchy picture of Titan's surface, totally obscured by clouds and haze, will much improve when the Cassini spacecraft, which is carrying the Huygens probe, starts an intense observation of Titan later this month. While on-board Infrared imaging cameras can pierce the cloud cover, however, they can only reveal bright and dark spots on the surface, which are difficult to interpret. What Huygens will encounter at Titan's surface will remain a mystery until the probe plops into an ocean or parachutes to solid ground. "Based upon their spectral characteristics, the bright areas imaged by various Earth-bound Telescopes and the Hubble Space Telescope could be a mixture of rock and water ice," de Pater said. Such a mixture appears relatively bright in comparison with substances like tar and liquid hydrocarbons, which absorb essentially all sunlight at these wavelengths and hence appear very dark. "The dark areas could contain liquid hydrocarbons," she said. "But they're all still a mystery." Some scientists have suggested that one large bright area, Xanadu, is a mountain of rock and water ice that stands out because runoff (hydrocarbon rain) has washed off the dark hydrocarbon particles. UC Berkeley graduate student J. Taylor Perron and de Pater concluded in one of the papers that such an ice continent, primarily composed of water ice, could be no higher than 3 to 7 kilometers - that is, at most, 23,000 feet, about the height of Mt. Aconcagua in Argentina. That is even more impressive on a globe less than half the diameter of Earth. The Huygens probe, which will take from two to two and a half hours to float to the surface, is aiming for a landing site in a dark area bordering a bright area near the equator, so it could land instead in a gasoline-like hydrocarbon brew of methane, propane or butane. Though the probe is designed to float, its builders expect, at most, 45 minutes of data once it sets down. A few minutes would be cause for celebration. The Cassini/Huygens spacecraft was launched from Kennedy Space Center in 1997, the product of an international collaboration between three space agencies - the National Aeronautics and Space Administration, the European Space Agency and the Italian Space agency - involving contributions from 17 nations. It arrived at Saturn in July 2004, beginning a four-year mission to photograph and collect data on Saturn, its rings and moons. This Oct. 26, it will get within 1,000 kilometers of Titan - closer than ever before - turning its remote sensing instruments on that moon's surface and atmosphere. Cassini will release the Huygens probe on Christmas Day, Dec. 25. The second largest Moon in the solar system and the only one with a thick, methane-rich, nitrogen atmosphere, Titan intrigues scientists because of its resemblance to a young Earth. The atmospheres of both Titan and the early Earth were dominated by nearly the same amount of nitrogen, and the Chemistry discovered on Titan could provide clues to the origins of life on our planet. De Pater and Chemistry graduate student Mate Adamkovics have used the adaptive optics on the Keck telescope in Hawaii to image the hydrocarbon haze that envelops the moon, taking snapshots at various altitudes from 150 to 200 kilometers down to the surface. In the movie they constructed from these snapshots, haze is very evident in the atmosphere at about 30-50 kilometers over the South Pole. Stratospheric haze at about 150 kilometers is visible over a large area in the northern hemisphere but not the southern hemisphere, an asymmetry observed previously. And at the southern hemisphere's tropopause - the border between the lower atmosphere and the stratosphere at about 42 kilometers altitude - cirrus haze is visible, analogous to cirrus haze on Earth. These observations agree with a theory of haze formation whereby sunlight creates haze particles at a high altitude - 400 to 600 kilometers above the surface - that are blown to the winter pole, where the haze accumulates as a polar "hood." The haze particles start to settle out and are carried by a lower-elevation return flow to the summer hemisphere. Laboratory experiments by Melissa Trainer of the University of Colorado, Boulder, reported in the journal suggest that the haze particles could be polycyclic aromatic hydrocarbons if the methane concentration in the atmosphere is high - around 10 percent - though they would be primarily long-chain hydrocarbons at low concentrations. The Huygens probe will measure gas concentrations as it plummets through the atmosphere, hopefully testing this connection between methane concentration and aerosol composition. Cassini's observations of Titan over the next four years should yield much more information about the atmospheric haze and surface topography, as well as raise new questions. De Pater urges ground-based Astronomers to continue to observe Titan's moon, "so the Cassini/Huygens data can be tied in with the long-term data base on Titan's seasons," she wrote. De Pater herself will be peering at Titan through the Keck telescope on Jan. 15 when the Huygens probe disappears into the atmosphere. "I'm skeptical that we'll see a meteor trail, as some have predicted, but our observations will give us a good image of Titan at the time of probe entry, which could be very relevant to calibrating Titan at entry time," de Pater said. De Pater's research is supported by the National Science Foundation. The Nov. 17, 2003, workshop on Titan was sponsored by the Center for Integrative Planetary Studies at UC Berkeley.